We are very excited to be named one of the Top 10 Cold Brews in the country by Huffington Post! Previously we were named to Best Of lists by Imbibe Magazine (twice) and Brit.co. Below is an excerpt. As soon as summer hits, iced coffee season goes into full gear. But not just hot-brewed coffee poured over ice. No, we’re talking cold brew. The intensely strong coffee is slowly steeped over 12 hours in cold water before being strained and served over ice (with or without lightener) into your cup. Cold brew coffee is simple enough to make at home — and really good too, so long as you don’t make rookie mistakes — but it requires planning and motivation, which not everyone is full of during the lazy summer months. Lucky for all of us, the market is teeming with cold brew options these days. Some roasters are brewing concentrates, which should be diluted with water, some are making ready-to-go bottles and cans, and all of them are worth knowing about. We blind taste tested more cold brew than we probably should be drinking in one sitting, in hopes of finding the best ones you should be enjoying and the worst ones you should be steering clear of. What we found is that you can’t go wrong with any of the cold brews we’ve listed. A light, chocolatey, smooth taste, drinking this cold brew straight from the bottle feels like a gift from the summer gods. 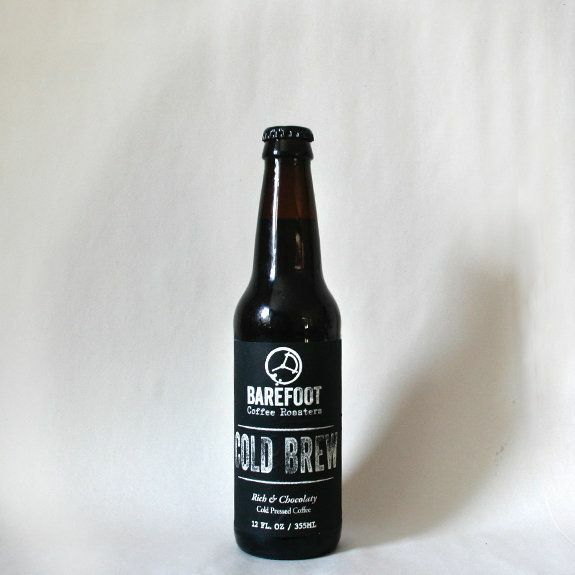 Since 2003 Barefoot has been dedicated to treating coffee like a culinary art and that comes across in this bottle.